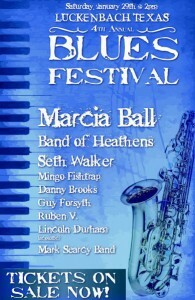 It’s the 4th Annual Blues Fest at Luckenbach, Texas!! Headlining this year is Marcia Ball. A full day of Blues of every kind featuring performances by The Band of Heathens, Seth Walker, Lincoln Durham, Mingo FishTrap, Guy Forsyth, Ruben V, Danny Brooks, and Mark Searcy Band. This is an all day event…starting at 2pm, non stop music til midnight. The Feedlot will be open and serving the finest Pulled Pork, BBQ, Hamburgers, sausage wraps etc. As always, they serve beer and wine in our bar. All ages welcome.